Astronomers using ALMA studied a cataclysmic stellar explosion known as a gamma-ray burst, or GRB, and found its enduring “afterglow.” The rebound, or reverse shock, triggered by the GRB’s powerful jets slamming into surrounding debris, lasted thousands of times longer than expected. These observations provide fresh insights into the physics of GRBs, one of the universe’s most energetic explosions. In the blink of an eye, a massive star more than 2 billion light-years away lost a million-year-long fight against gravity and collapsed, triggering a supernova and forming a black hole at its center. This newborn black hole belched a fleeting yet astonishingly intense flash of gamma rays known as a gamma-ray burst (GRB) toward Earth, where it was detected by NASA’s Neil Gehrels Swift Observatory on 19 December 2016. 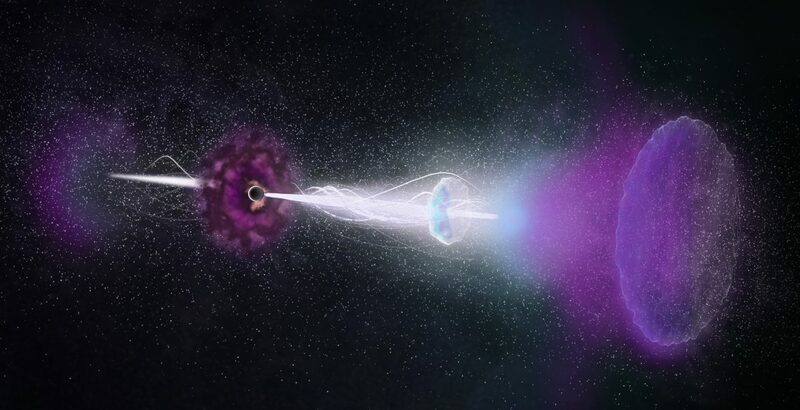 While the gamma rays from the burst disappeared from view a scant seven seconds later, longer wavelengths of light from the explosion — including X-ray, visible light, and radio — continued to shine for weeks. This allowed astronomers to study the aftermath of this fantastically energetic event, known as GRB 161219B, with many ground-based observatories, including the National Science Foundation’s Very Large Array.